The map above comes from the Nuclear Emergency Tracking Center. 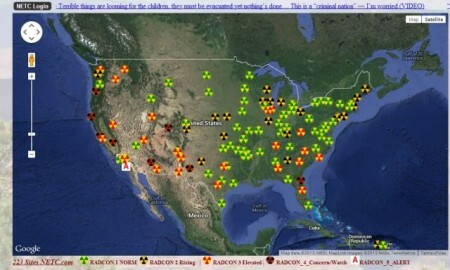 It shows that radiation levels at radiation monitoring stations all over the country are elevated. As you will notice, this is particularly true along the west coast of the United States. Every single day, 300 tons of radioactive water from Fukushima enters the Pacific Ocean. That means that the total amount of radioactive material released from Fukushima is constantly increasing, and it is steadily building up in our food chain.